In 2016, researchers at Molde University College began a 2-year project sponsored by the Norwegian Agency for Digital Learning (Norgesuniversitetet), led by me. The project also brought together researchers from Norwegian University of Science and Technology (NTNU) to provide expertise in the pedagogic design. 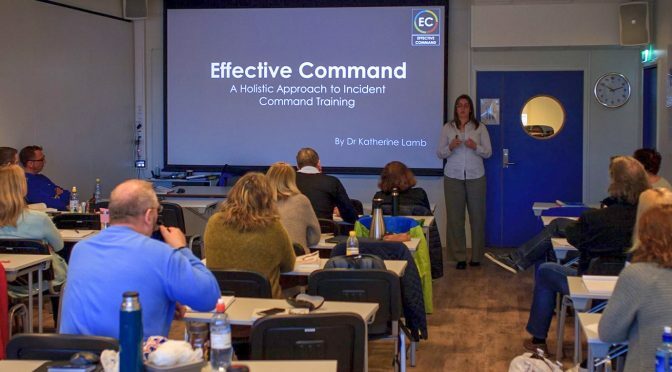 In addition, and importantly, we reached out to partner with Dr. Katherine Lamb, founder of Effective Command in UK, an expert in Emergency Management training and competence assessment. Three years after the commencement of the project, these international collaborations and exercises were paying dividends. On March 23rd 2019, the cruise ship «Viking Sky» had lost it engines and began signalling a mayday distress call. Gale force winds and waves up to eight meters threatened the lives of the approx. 1,300 persons on board. The rescue of persons and ship would involve 915 passengers being air lifted, and the ship being towed to Molde harbour with the remaining passengers and crew. That this operation was a success, involves many factors. However, a little of that success, according to Jørgen Nordheim, Emergency Management leader (Beredskapsleder), in Molde municipality, may be credited to an international collaboration facilitated by this project. Recently, Jørgen Nordheim called Katherine Lamb to thank her for the lectures that she delivered during the project, that he strongly believes they contributed to the positive outcome of the incident. Molde University College, in 2016, had an active 2-year continuing education programme in Emergency Management (Beredskap). We had also just received approval to start the project funded by Norgesuniversitetet, called: Active Learning Module for Emergency Management Professionals using Virtual Reality. The project had an academic objective to achieve cooperation between higher education and work life through the development of a virtual training module that would aid students in learning to communicate and make decisions in simulated crisis situations. The project also had the research objective to see if in using the VR simulation tool would aid students in visualizing situations to make certain decisions in the simulated environment. In April 2016, Jørgen Nordheim was leading the course in EM Planning for Molde University College. He opened-up his classroom to allow his students to participate on our research project. It is important to note the Active Learning Module was not intended to be students interacting only with VR technology. But, rather, an important part of the learning experience was that the students would meet and receive a preparatory lecture and instruction from an expert in Emergency Management, in this case Dr. Katherine Lamb. As the former leader of the ALM project, I reflect that we as researchers and educators were seeking to make the connection between work life and academia. However, by the end of the project it was astoundingly clear how important that connection was. The external, international, professional expertise of Lamb’s involvement had contributed to the design and validation of our project, and that involvement was critical to achieving our academic and research objectives. Overall, we think that this story gives clear evidence of how the relationships established through international contacts can create better quality in our education programmes, in our research, and can even have lasting implications for our students, faculty and society at large.